In all, authorities reported that five people were wounded. In addition to Scalise, Zack Barth, a staffer for Texas Rep. Roger Williams, and Matt Mika, a former staffer who is now the director of government relations for Tyson Foods, were shot in the attack. Capitol Police officer Krystal Griner, part of Scalise’s security detail, reportedly was shot in the ankle and another officer protecting Scalise, David Bailey, was treated for minor shrapnel injuries at a hospital and released. President Donald Trump announced later that the shooter died in hospital from injuries sustained in a shootout with officers. The gunman was identified as James T. Hodgkinson of Belleville, Illinois. “An attack on one of us is an attack on all of us,” Ryan said before members of the House on both sides of the aisle stood and cheered while applauding. Barth, a legislative correspondent for Williams, later posted on Facebook that he was OK. Mika was described to Roll Call as a former Hill staffer who continued to work out with the team, helping fill out practice. “He has been taken to a local hospital and we’re awaiting word on his condition. Matt has worked for Tyson Foods for more than six years and we’re deeply concerned about him and his family,” Tyson Foods said in a statement. Michigan GOP Rep. Tim Walberg said at a subcommittee hearing Wednesday that Mika was a former staffer of his and “became like a third son” to him. Walberg said Mika was in grave condition and is undergoing surgery. Texas Rep. Joe L. Barton, the GOP’s team manager, said there were 22 members at the practice. Alabama Rep. Mo Brooks was taking swings in the batting cage Wednesday when he heard the shooter open fire — and briefly caught a glimpse of him. Brooks earlier told CNN Scalise was hit as he stood near second base and he watched him crawl into the outfield as the other players and coaches hit the ground. “There was a blood trail about 10 to 15 yards long from where he was shot to where he crawled into right field,” he said. Britton said the shooter exchanged fire with someone crouched down behind a black SUV firing over the hood. A man was lying on the ground between the wheels of the SUV. He later saw the suspect handcuffed and lying on the ground. He initially said it was “not an assassination attempt” but later said authorities weren’t sure as yet and that he misspoke. “No, not aware of that at all,” Slater said, when asked if it was politically motivated. Capitol Police Chief Matthew R. Verderosa said it was his “understanding” that his officers engaged the suspect. Barth, a staffer with Williams, one of the team’s coaches, was among those shot, according to a release put out by the Texas Republican. Barth, a legislative correspondent, later posted on Facebook that he was OK.
Williams hurt his ankle amid all the chaos and was put on a stretcher, a source told Roll Call. He was not shot by the gunman. Williams tweeted that Barth is expected to make a full recovery. Williams said he likely hurt his ankle, foot and leg when he dove into a dugout amid shots being fired. He said he would be coaching behind third base during the game. He said he’s gotten treatment to let him still participate in the game before he sees his own doctors in his home district. “They have got me going enough to play the game,” Williams said of his treatment. Williams said Wednesday evening that Barth has been released from the hospital. He said Barth was texting while shots were being fired to let people know they were under fire and needed help. Williams said he believes the first shot members heard was aimed at Trent Kelly, who was on third base. As the shooting began, Brooks said he and a few others took cover behind the batting cage tarp before scurrying to the other side of the field and diving into the first-base dugout for cover, where Brooks and a staffer unlooped their belts and applied a tourniquet to one of the victims who’d been shot in the leg. As they lay prone in the first-base dugout, one of the Capitol police officers who’d been wounded by the shooter’s gunfire opened fire toward the third-base dugout, where the shooter had holed up. “I think the guy shot at Kelly and missed him. And then he shot again and I started running in and I saw Scalise go down. We took cover and and that&apos;s probably even much it,” Palmer said. “And then Scalise’s security detail said the guy was moving around that side,” he said. “We took cover behind the big block building." Palmer said all players gave a police report. “And I called my wife to let her know I was OK,” he said. Speaking to reporters later, Brooks repeatedly praised the actions of the Capitol Police officers who stopped the shooter and mitigated the carnage. “For the grace of God, and the aim of … our Capitol Police officers shooting back, you know, I’d be with Steve Scalise in a hospital someplace along with some of our other people,” Brooks said. 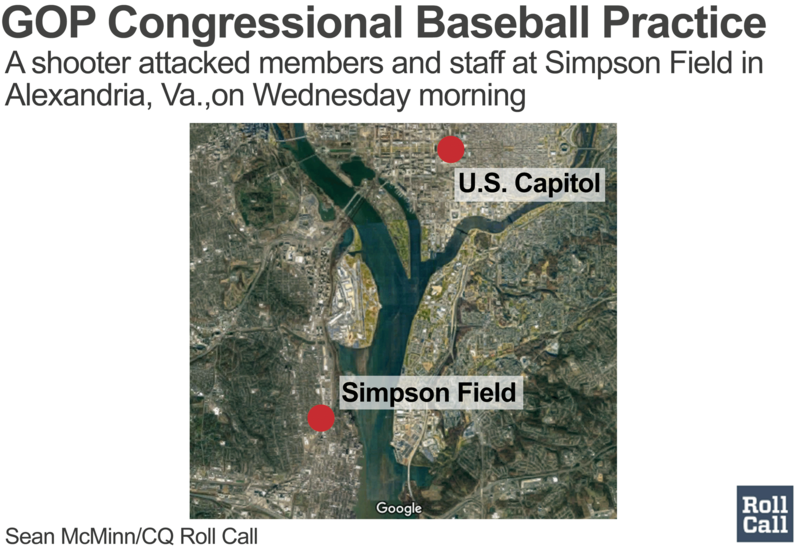 The Capitol Police were present in a Suburban SUV parked outside the field’s fence at practices because they travel with Scalise. “All we would have had is baseball bats against a riffle,” Brooks said. Brooks tweeted about the shooting later Wednesday morning. Praying for those injured at this morning&apos;s practice. I&apos;m especially thankful to the US Capitol Police who risked their lived to protect us. At the Democrats’ baseball practice, which takes place at the same time at Gallaudet University in Washington, D.C., there is no Capitol Police presence. The Kentucky Republican said he was able to get out of the fence. There is one fence opening point to the parking lot and one by Scalise’s security detail to get out of the area. Paul estimated 50 to 60 shots were fired between the gunman and police. “Nobody would have survived without the Capitol Hill police. They saved everybody&apos;s life,” Paul told CNN. Trump’s initial statement said the victims were in his thoughts and he called Scalise “a true friend and patriot” on Twitter. “The Vice President and I are aware of the shooting incident in Virginia and are monitoring developments closely. We are deeply saddened by this tragedy,” Trump said in the statement. Current and former lawmakers also responded. The team practices at E. Monroe Ave. in Alexandria, Virginia. Simpson Field is at the heart of an athletic and recreation complex in the heart of a residential and commercial block in Alexandria. Alexandria area schools are currently closed, according to MSNBC. “I was out walking my dog and then they condoned of my neighborhood,” said Ann Shackleton, a local resident. “The only reason I’m here is because I’m trying to get home.” She said she did not hear the shots. Capitol Police were showing a more enhanced security posture at the Capitol in the wake of the Alexandria shooting. Officers near the South Door on the House side said they knew little about the situation but were on enhanced guard. Two of three officers wielded AR-15 automatic rifles. Only members being allowed to enter Capitol building from outside. Staff, including press, being redirected to office buildings. The Congressional Baseball Game is scheduled to be played on Thursday. Thursday’s game is in honor the victims of the Manchester and London terror attacks and British Ambassador Nigel Kim Darroch is slated to throw out the first pitch, HOH reported on Monday. Bridget Bowman, Lindsey McPherson, Stephanie Akin, Simone Pathé, Rema Rahman, Thomas McKinless, Griffin Connolly, Niels Lesniewski, Joe Williams, John T. Bennett, George LeVines and Ellyn Ferguson contributed to this report.Get breaking news alerts and more from Roll Call on your iPhone or your Android.